Ever since the economy became unstable, seeds of negativity and fear have been planted. One powerful way we can turn this negative thinking around is through the practice of Positive Affirmations. 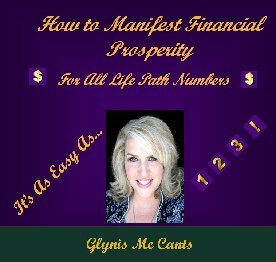 This new CD is all about Manifesting Financial Security in your life! The CD gives you seven different Money Affirmations--one for each day of the week that you do with me for 15 minutes. Once you start doing these Affirmations daily, you will feel better and more optimistic about your future. I also have included three bonus tracks. The first one is a breathing exercise that helps you to relax and focus on abundance. The second one is to help you mentally prepare for a job interview, and the third one gives you a list of career suggestions for each Life Path Number. I have been doing Affirmations consistently for many years now, and what I know for sure isif you commit do doing the Affirmations that are on this CD daily,you will flip the financial side of your life!